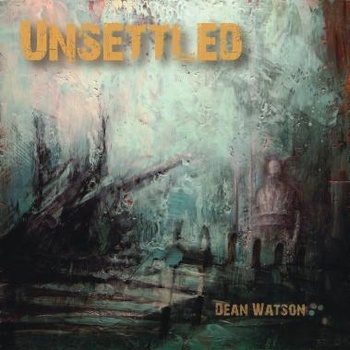 While so-called ‘solo-pilot’ instrumental albums seem to be rather ubiquitous these days (with results not always up to scratch), it is far from an everyday occurrence to come across an album as impressive as Unsettled, Dean Watson’s debut release – even more so if we consider that we are dealing with a wholly independent production. An amazingly accomplished disc, structured in a remarkably balanced way, it presents music that is eclectic without being directionless, and complex without being unnecessarily convoluted. For such a proficient composer and multi-instrumentalist, Toronto-based Dean Watson is a very unassuming character, in spite of his decades-long experience in the music world. Dispensing with the bells and whistles to which so many new acts seem to be addicted, he has embarked on the promotion of his music completely on his own, offering his album for review on progressive rock discussion boards, and eliciting almost unanimously positive feedback. Indeed, though it falls somewhat short of perfection, Unsettled as a whole is an impressively cohesive effort: inspired by the painting of the same name by Ron Eady (a visual artist also based in Toronto), it is conceived as a sonic rendition of the painting itself, realized with a successful blend of emotion and technical skill that often eludes all-instrumental productions. Other reviewers have labelled Unsettled as progressive fusion, and, in some ways at least, the description fits the album quite well – especially if we take into account the many diverse sources of inspiration (listed by Watson on his MySpace page) that make up its sound. the actual jazz-rock component in Unsettled is rather restrained, sharing the stage with spacey touches, progressive metal overtones, and even subtle classic rock influences. Although comparisons have been made with the likes of Planet X and Liquid Tension Experiment – at least as regards those moments on the album where things take a more metallic turn – I feel they limit the scope of Watson’s creative impulse. In fact, while some tracks on the album may bring to mind the aforementioned, hyper-technical instrumental combos, others reveal a vintage jazz-rock feel akin to Jeff Beck’s two seminal mid-Seventies albums, Blow by Blow and Wired, eschewing the feeling of chilly perfection that often plagues the output of metal-fusion acts. Unsettled’s main flaw lies in the use of programmed drums, though they are nowhere as annoying than on other similar projects. True, their artificial nature occasionally surfaces, marring (albeit slightly) the otherwise warm and engaging sound of the compositions, and making one wonder how the album would sound if Watson had instead gone for the real thing. A couple of tracks also come across as somewhat less cohesive than the others, with abrupt changes in mood and pace that may leave the listener a tad baffled. However, the level of both composition and execution is so consistently high that it amply compensates for these shortcomings. Running at around 52 minutes, Unsettled is a compact album that strikes the right balance between longer, more complex compositions and shorter numbers with a more direct impact. Watson’s approach definitely helps the listener to concentrate on each number, and appreciate the diversity on offer. Watson always keeps melody at the forefront, opting for power rather than harshness when introducing heavy riffing into the fabric of his songs, so that even the heaviest moments are amazingly tuneful. Opener “The Encounter” is a good example of how Watson merges progressive metal vibes with more sedate moods; the use of keyboard-based riffs reminded me of Relocator’s self-titled debut (another excellent instrumental album released in 2010), with various electronic effects adding a spacey note, and some remarkable Hammond organ and guitar work. “Sequence of Events”, one of the shortest items on the album at barely over 3 minutes, offers an intense, almost concentrated atmosphere made of brisk keyboard flights and hard-edged riffing reminiscent of classic instrumental metal-fusion; while the brisk, high-energy “Orb” would have been more effective without the overpowering drums and whistling synth sounds. On the other hand, Watson’s talent emerges most clearly in those tracks where the prog-metal component is kept to a minimum – such as the jazzy, almost funky “The Push”, relying on some fine organ-guitar interplay with a warm, rugged Seventies sound, or the exhilarating “Gray Matter”, propelled by energetic bass and drums and showcasing Watson’s outstanding skills as a guitarist. His soloing here, as well as in the splendid first half of “The Departure”, possesses a clean, melodic feel that evokes the aforementioned Jeff Beck, as well as another guitar great, Irish legend Gary Moore. While the latter number is somewhat marred by an abrupt change in pace and style towards the end, its slow-burning, wistful first half brought to my mind some of Moore’s more meditative pieces, such as “Sunset”, “The Loner” or “Gary’s Lament”. With “Out of the Mist”, the longest piece on the album (and possibly its highlight), we are presented with a musical version of Ron Eady’s intriguing cover painting, with its romantic, melancholy beginning, backed by strings that add depth to the beautiful strumming of the acoustic and electric guitars, and a second half full of tension and menace, driven by intense riffing and crashing drums. Though the problem with an album such as Unsettled might lie in its evident metal subtext – which may put off the more conservative jazz-fusion fans – lovers of eclectic instrumental rock will definitely find a lot to enjoy in this finely-crafted effort, an excellent debut from an outstanding musician. In any case, it would be interesting to see Watson branch out and enlist the help of some other musicians, in order to bring his compositions before a live audience.